In the lush green rolling hills of Molo in Kenya lies Baraka Agricultural College, an exemplary Agricultural Technical Vocational and Training (ATVET) institution whose focus on nurturing skilled, relevant and market ready graduates is visible. Baraka Agricultural College prides in its competence based training approach that it executes in a range of training offerings including: Diploma in horticulture producer, Diploma in entrepreneurial agriculture, Diploma in sustainable agriculture and rural development, Certificate in horticulture producer, Certificate in agripreneurship, Certificate in agripreneurship, Certificate in dairy farm management, Certificate in fishery technology, Certificate in bee keeping, and Certificate in sustainable agriculture and rural development. These course offerings respond to the market needs at local and regional level, especially the need for hands-on graduates that service agricultural production operations. Baraka Agricultural College works with several partners including universities. Through a partnership with Egerton University in implementing the project on “Enhancing Access to High Quality Seed Potato for Improved Productivity and Income of Smallholder Farmers in Nakuru County”, the college has once again demonstrated the unequivocal role the ATVETs play in agricultural and rural transformation. This project is financed through the Community Action Research Programme Plus (CARP+) competitive grants mechanism of the Regional Universities Forum for Capacity Building in Agriculture (RUFORUM). In under one year of engagement, on a three acre piece of land, the college harvested 400 bags of clean seed potato. Part of this seed has served as foundation seed that has now been planted on a five acre piece of land. The farm operations have become self-sustaining as some of the potato bags were sold to finance clean seed production. While this intervention appears to be simple, within the college and beyond, it is ‘a gold star turn around’ response from the college; demonstrating the working effectiveness of the partnership between universities and ATVET institutions. To Ms. Virginia Nyamu, the Principal of the college and her staff, the partnership with Egerton University and RUFORUM has delivered for the college on several fronts; i) staff and students are having opportunity for enhanced practical sessions; ii) Baraka Agricultural College is responding to actual need in the community in terms of the shortage of clean potato seed; iii) this intervention has positioned the college for investment by other development partners including the Government of Kenya through the ‘Big Four Agenda’ with a focus to promote production of potato; one of the three key food and income security crops in Kenya; iv) the project has elevated awareness among staff and management for the sustainability of farm operations and the need to increase their entrepreneurship programmes within the college. Owing to the success of the first harvest of the seed potato and the subsequent expansion from three to five acres, Ms. Virginia Nyamu has applied for a 100 acre piece of land from her Board. As a Catholic faith based institution, the church has this land within the area. This is part of the college’s response to heightened demand for clean potato seed. The small first harvest of 400 bags, has attracted immense requests from farmers and traders in potato seed, unfortunately their stock has run out in a short while! This partnership between Egerton University, RUFORUM and Baraka Agricultural College, is also developing National Occupational Standards for Pig Producer Assistant Level 3 and Level 4 in partnership with industry, experts and Curriculum Development Accreditation and certification Curriculum (CDACC). This is hoped to be translated into a competency based curriculum that will be available to strengthen the capacity of pig producers to support the production of high quality pork in Kenya. This initiative is financed through the RUFORUM Technical Skills Development Programme (TESDEP). 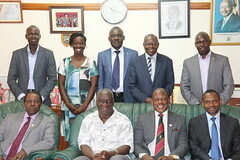 Both the Potato CARP+ project and the Pig Occupation Standards development are part of the ‘Transforming African Agricultural Universities to meaningfully contribute to Africa’s growth and development (TAGDev)’ a RUFORUM’s Vision 2030 flagship programme currently financed by the mastercard foundation.